Welcome to the Raw Report! I am @TheMagnumDA. We are LIVE from Pittsburgh, PA. The Raw General Manager Kurt Angle joins us first! The hometown boy gets a hell of a reaction. 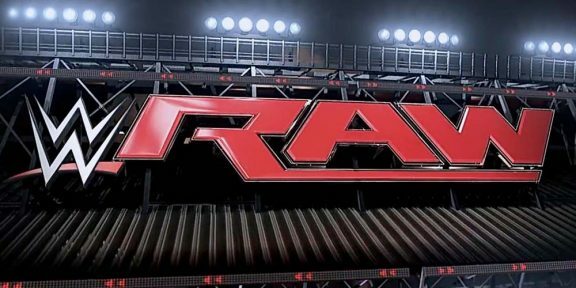 Angle recaps last week’s Raw, and then announces the matches and events for this evening. Before he leaves, BRRRROCK Lesnar and Paul Heyman interrupt! Heyman tells Angle that he sees through the charade. Angle is booking Lesnar in a Fatal 4 Way to give him a 25% chance of winning. 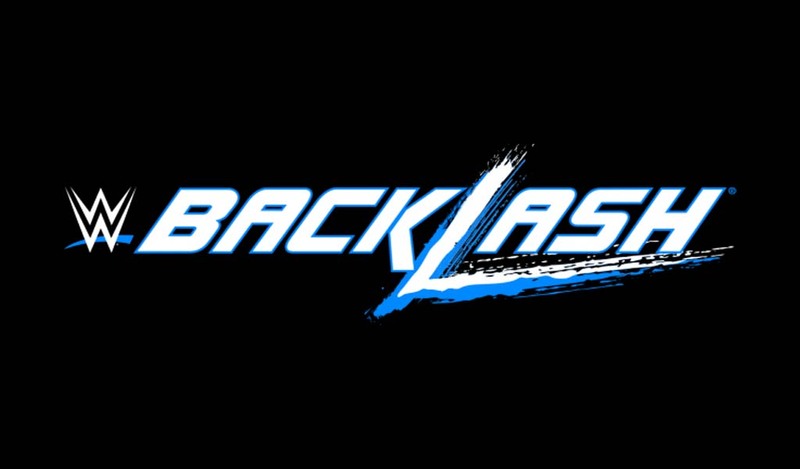 Heyman knows that Angle is trying to take the title off of Lesnar because of his ambitions to return to the UFC. Heyman informs Angle that if Brock Lesnar does not walk out with the WWE Universal Championship at the end of Summerslam, then he will leave WWE for good! Wow. The Revival are on commentary. Matt and Karl Anderson lock up to start. Matt blocks a fist and grabs a headlock. Eventually, Anderson brings Matt down with a back suplex, but Hardy is able to get up and tag his brother Jeff. They trade another tag, followed by a double team move. Matt continues to work the arm while tagging in Brother Nero once more. ROLLING THUNDER for two, but Gallows breaks it up. Luke ends up eating some Poetry in Motion, for his troubles. We go to break. After the break, Gallows pounds on Jeff, and then takes him in the corner for more pounding. Gallows tries to get a cover, but only gets two. Jeff finally recovers and hits Luke with a Twist of Fate! Jeff tries for the tag, but Gallows gets to Anderson first. Karl misses a charge in the corner and HOT TAG TO MATT! House of fiyah! Side Effect from the middle rope, followed by an elbow from the middle rope. Matt hits a proper Side Effect for one, two, no! 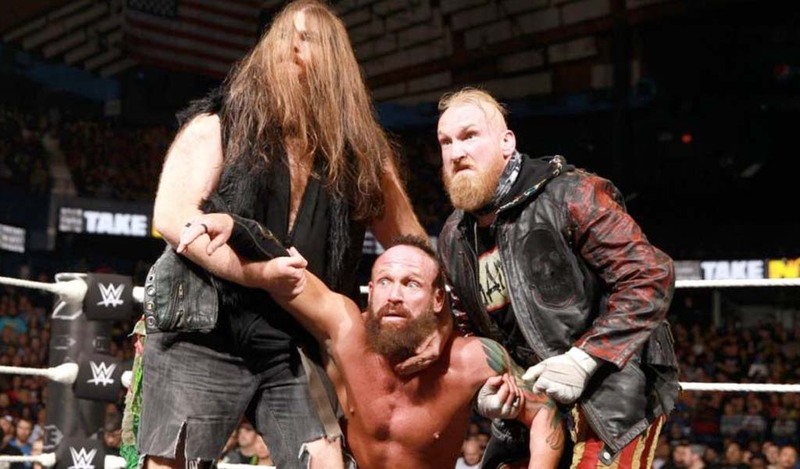 Anderson gets an elbow in the eye, and Gallows boots Matt in the back of the head! They try the Magic Killer, but Jeff comes in with a Buzzkiller! Matt finally hits the Twist of Fate, and tags in Jeff for the Swanton Bomb! One, two, three! After the match, all three teams brawl on the stage! Double Twist of Fate on Scott Dawson!! POETRY IN MOTION OFF THE STAGE! Insanely delightful! Renee is backstage with Dean Ambrose. They talk about last week’s main event, when Seth Rollins interrupts! Dean says that last week felt good, and it left him thinking about putting a team together again. Seth feels the same way, but Dean cuts him off and tells him that he was burned once, and he refuses to let it happen again. After a break, Seth is despondent backstage. Sheamus and Cesaro stand in his way, and start to talk trash at Seth. Seth challenges them to a fight, and Sheamus gladly accepts for later tonight. Cedric and Nese start. They lock up, and Nese stops everything to pose. Nice. Nese definitely has a “Paul Roma” vibe to him. Nese with an armbar, but Cedric leaps up and reverses. Headscissors for Nese! Ariya tags in, but Cedric is ready with an armbar. Swann tags in, and catches a SWEET Frankensteiner for two. Armbar, and a tag to Akira. He keeps the psychology on the left arm, with kicks and attacks from the ropes. Senton splash gets two on Daivari. Ariya grabs Tozawa’s injured shoulder, and WRENCHES IT. Akira falls right to the ground and immediately grabs the left shoulder. Titus tries to talk him out of the match (“Save yourself for tomorrow night’s #1 contendership!”) but Akira refuses to quit as we go to break. After the break, Ariya has Tozawa in an armbar that focuses on the injured left shoulder. Tozawa fights up, and catches the running knee after an awesome exchange. Tozawa tags in Swanna, and he drills TJP with some clotheslines and a splash for two! Nese breaks it up, but runs right into Cedric’s waiting arms. Swann and Alexander with splashes in stereo! Akira follows up with a suicide dive to Daivari outside! Back in the ring, TJP tries to finish Rich Swann with a rollup, but it’s reversed for two! Swann tags in Akira, and then plants a HUGE kick to TJP’s face. Akira with a Senton Bomb from the top rope onto TJP! One, two, three! Akira moves on to 205 Live tomorrow night, where he will face Ariya Daivari. The winner moves on to SummerSlam to face Neville for the Cruiserweight Championship! MizTV is next! The Miztourage is out for MizTV! The fans in Pittsburgh immediately start getting on Miz’s case. Miz, of course, is from the rival city of Cleveland, OH. Miz introduces his guest for tonight…the son of Kurt Angle, Jason Jordan! Jordan’s new music blows goats. I have proof. LISTEN TO IT. Miz wrongly points out that Jason already has some naysayers in the crowd. Jordan starts talking back to Miz, calling him an expert on receiving “boo’s” from the crowd. Miz even offers a spot with The Miztourage to Jason, but he says, “I’m good.” Miz tells Jordan that he’s won the main event of WrestleMania, so he knows what he’s talking about. Jason politely declines once more, so Miz starts insulting Jason by telling him that “Daddy can get him anything he wants, including a title match.” Jason says he’s going to do this the right way, without any help. Miz says that Kurt Angle is pitiful, just like the city of Pittsburgh. Jordan warns him, “You can say whatever you want about me, but don’t say another word about Kurt.” They stand face-to-face, and Jordan lays out Miz with a belly-to-belly suplex right into Axel and Dallas! Jordan leaves the ring as MizTV comes to an abrupt end! Roman Reigns’ video package is played. Great stuff. Hopefully all of the challengers get one of these. They lock up, and Sheamus shoves off Seth with a laugh. Rollins turns a headlock into a wristlock, but Sheamus reverses with a headlock. Sheamus takes him down, and although Rollins gets up, he takes a Shoulder Charge. Seth rebounds with an elbow, a knee, and a dropkick. Sheamus lands an elbow in Rollins’ eye from the ropes, but Rollins reverses with a dropkick. Botched suicide dive by Seth, as Cesaro interrupts! This allows Sheamus to grab Rollins from the ropes and beat him down outside the ring! Sheamus stands tall over Rollins as we go to a break. After the break, Rollins fights out of a Rolling Senton from the middle rope, but Sheamus overpowers and HITS IT for one, two, no! Rollins fights up and they have a great exchange leading to the Irish Curse Backbreaker for two! Sheamus charges Rollins in the corner, and then misses the clothesline from the top rope! Rollins hits a front DDT onto the middle turnbuckle for two! Seth with chops and kicks, but Sheamus reverses with a MASSIVE right hand! Rollins returns serve with a dropkick and a suicide dive through the middle rope. Back inside, awesome clothesline followed by a Sling Blade! Cesaro tries to interrupt, but Rollins turns it into a rollup opportunity for the one, two, three! After the match, Sheamus and Cesaro destroy Seth Rollins in the ring! Double team White Noise onto Rollins! The referees tell Sheamus and Cesaro to leave, as the crowd chants “We want Ambrose!” The tag champions return for more, but Dean Ambrose cuts them off at the pass! Eventually, Sheamus and Cesaro turn their 2-on-1 attack to Dean Ambrose. NEUTRALIZER by Cesaro onto Ambrose! Chorus of boo’s from the Pittsburgh crowd. Dean eggs them on, telling the champs, “Come on! Give me some more!” Cesaro instantly clobbers him, leading to a BROGUE KICK by Sheamus! Those Shield boys got crushed this evening. Bray Wyatt is out for a promo! He cuts a rare city-focused heel promo, calling Pittsburgh “pitiful.” Hey, where have I heard that before? Vince must love this city. Wyatt tells the fans that they are fools for believing in someone like Finn Balor. Wyatt goes into hysterics, laughing himself to the mat! Somehow, he was able to get this entire crowd to turn against him. The LIGHTS GO OUT! The first part of Balor’s music plays, but Balor is not on the stage…he’s in the ring! Overhead kick to Bray! Diving dropkick to Bray through the ropes, followed by another running dropkick by Balor that sends Wyatt over the barricade! Looks like we have a SummerSlam program on our hands. Braun Strowman video package is played. Wow, he can sure read a teleprompter well. Still, another good video package. The Triple Threat is NEXT! Braun dominates both men early, standing tall with both men knocked out of the ring. After a break, Joe and Roman team up to take out Strowman. Joe and Roman trade right hands, but Joe secures an armbar that brings Roman down. Strowman gets back up and nails Joe. All three men start fighting outside, and the fight spills out into the crowd! Strowman throws two rights into Reigns, and then tosses him into the barricade. Strowman gets pulled into a Coquina Clutch over the top of the barricade! Joe has it locked in! Reigns interrupts the sleeperhold, but then Joe returns the favor by throwing Reigns into the barricade. Overhead kick by Samoa Joe! Back into the ring, Joe tries a Uranage Slam, but Reigns hits Joe with some back elbows, followed by series of clotheslines in the corner! 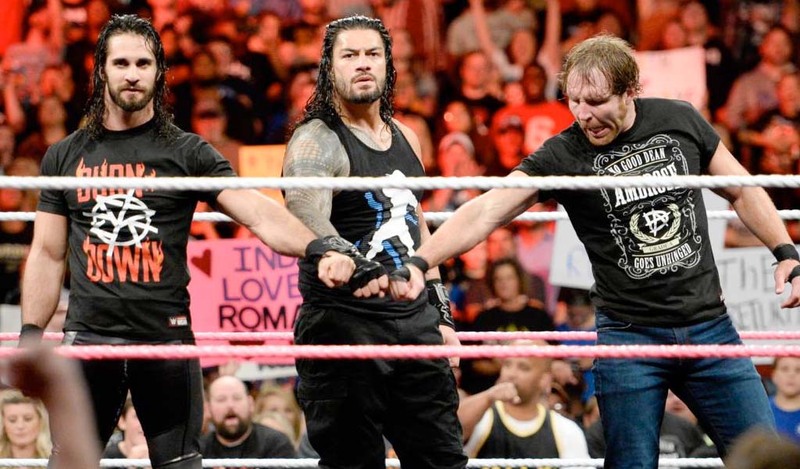 Another flying clothesline, and Roman Reigns is building momentum! Joe rolls outside the ring to avoid the Superman Punch, but Roman catches him outside the ring! The Superman Punch off the steps to Joe! Roman goes for the Spear on Strowman, but Braun serves Roman some BOOT for dinner! Strowman sends Reigns spine-first into the corner post, and then he hits Samoa Joe with a pull clothesline! Roman gets sent into the table by Strowman, and then Joe gets dropped AGAIN by Strowman. Reigns is tossed into the ring by Strowman, and then Braun throws the steps into the ring as well! Joe catches Strowman off-guard, and then hits the Senton onto Reigns for one, two, no! Joe props the steps into the corner, and tries to throw Reigns into the steps. They trade reversals, and then Joe hits the Coquina Clutch on Roman! Braun mows down BOTH MEN and then hits the Running Powerslam on Joe! One, two, no! Braun repeatedly throws Reigns into the corner, causing him to fall into a HEAP. Strowman picks up the steps, but Reigns hits him with a Superman Punch! Roman throws the steps at Strowman, knocking him outside the ring! Back inside, SPEAR to Samoa Joe by Reigns! One, two, three! We get a recap of Cass’ massacre of Enzo last week. Big Show made the save. After this, Enzo is backstage with Big Show. He tells Show how much he appreciates having someone look after him, especially after last week’s beatdown. Show tells him that it’s no problem, and that Cass needs a lesson in respect. THE DRIFTER IS HERE! He’s going strictly by “ELIAS” now. He talks about being from this area, which gets big cheers! Then he sings a song that completely runs down the city and its people. This gets tremendous “boo’s” from the crowd. Elias gets caught in a side headlock by Kalisto. Kalisto dances up the ropes and takes Elias down. Elias is nailed by a kick, but when Kalisto tries a headscissors…Elias throws him down and out of the ring! After the break, Elias drops some crushing knees to Kalisto’s kidneys. Kalisto fights out of a chinlock, but immediately gets dropped once more. Elias POUNDS Kalisto in the corner with punches and kicks. Series of hard backbreakers by Elias for two. We get a MINNESOTA BACKBREAKER (!!!) by Elias onto Kalisto. Elias just drops Kalisto to the mat, but Kalisto fights back with a series of kicks! He dodges Elias and hits another kick, followed by a Bombs Away! Face-first headscissors by Kalisto. Elias gets back up, and blasts Kalisto with a huge knee to the face. Elias hits the “Drift Away” for the one, two, three! Backstage, Charly is with Alexa Bliss. Alexa humiliates Sasha and Bayley by talking about the embarrassment Sasha must feel having lost to Bayley last week. Alexa says she’s looking forward to watching Bayley take on Nia Jax later tonight, because tonight…no one has Bayley’s back. We are then treated to a scene from WWE Studios’ new film, “Pure Country”, featuring Shawn Michaels. It’s so wild to think that Shawn could probably still outwork 75% of the roster, yet he’s relegated to movies. It’s too bad. Bayley catches some strikes on Jax, but Jax grabs Bayley by the hair and throws her out. Bayley comes back in, and Nia immediately brings her to the mat with a headbutt. Bayley gets up and continues the strikes. She tries to whip Jax, but Jax reverses it. Bayley gets on Nia’s shoulders, but Nia throws her right to the mat. Bayley is DROPPED shoulder-first onto the mat, rolling outside the ring. After a break, Nia continues the attack on Bayley with a seated Full Nelson. Bayley fights back with back elbows, and strikes to the corner after a reversal. Eventually, Jax picks up Bayley by her arms, and drops her face-first from the Tiger Suplex position. Bayley rolls outside as Jax mocks Bayley with the side ponytail. This goes over like a fart in church. Back inside, Jax hits a running splash in the corner. Bayley starts to fight back from the apron, but Jax knocks her down again. Jax WHIFFS on the elbow, drawing laughs from the crowd. Bayley hits a running dropkick, followed by the middle rope Stunner and a running knee! From the apron, Bayley hits a splash on Jax! Alexa Bliss tries to interrupt, but Bayley catches her off-guard with a forearm. Jax tries to splash Bayley into the corner post, but Bayley moves out of the way! The ref counts to ten, and it’s a count-out victory for Bayley! The story here is Bayley’s right shoulder. It looks like she was legitimately injured early in the bout. We’ll have to see what happens. Meanwhile, Charly is backstage with Cass. Cass thinks that Show is nothing more than a “miscreant”. I dare Cass to spell that word. Cass has new music. While it’s generic rock, it’s SO much better than that first dubstep theme. Before the bell even sounds, Show starts beating the living crap out of Cass in the corner. The bell rings, and Cass gets two kicks to the gut. Show takes over, and starts chopping Cass. Cass hits some more rights to the gut, but Show returns serve with a headbutt and some chops. Cass hits an elbow, and tries a whip into the ropes. This is reversed by Show, sending Cass all the way to the outside. Cass gets pulled back into the ring by the hair! Cass hangs Show up by the top rope, but Show hits Cass with a Shoulder Tackle when Cass came back into the ring. Cass gets nailed with a powerslam and a big elbow for the one, two, no! Big Show with a crisp suplex. Can’t believe I’m typing that. Show goes for the chokeslam, but Cass kicks Show in the knees, bringing him down. As Show writhes around in pain, Cass continues the attack on Show’s left knee. Show is able to kick Cass in the head to get out of the predicament, but Cass turns around with a SICK Mafia Kick. Cass goes to the top but gets chopped down. Show hits some clotheslines, and a corner splash to build momentum. However, Cass is ready with ANOTHER Mafia Kick to Show’s face. Enzo interrupts for the DQ, and HE gets another Mafia Kick to the mush! With Cass left standing, Show throws one more KO punch that hits! Both men go down! Eventually, Show stands tall over Cass as he helps Enzo to his feet. Show carries Enzo up the stage as we go to credits! Final Thoughts: This crowd was pooped by hour #3. I think there’s some hit or miss stuff going on. Is this the end of Brock? Time will tell. He’s definitely in the middle of a contract year. I’ll give WWE credit for this: After tomorrow, most of the SummerSlam card will be shaped out. That is much improved from previous years. As always, let it play out and see where it goes. @TheMagnumDA signing out!